Mikel San Jose is very quickly building himself a reputation in Spain as a tough-tackling, no nonsense centre back and national team coach Vicente Del Bosque has been monitoring the 22-year-old in action for Athletic Bilbao. The former Liverpool defender is fast becoming a world class defender back at his hometown club. San Jose started his career with Basque side Athletic Bilbao, where he quickly became one of the young stars of the youth side. Former Liverpool manager Rafa Benitez took note, and brought San Jose to the Premier League and Anfield back in 2007. After three years at Liverpool, and with no first team appearances to his name, in 2010 the Spaniard decided to return home and joined former club Bilbao again, signing a five year contract. His spell in England had clearly made him a different player. San Jose was immediately thrust into the first team at San Mames, and eventually became Bilbao's first choice centre back. San Jose has been regularly been appearing for the under 21 side, but now the full national team is taking note, as the development of this immensely talented youngster continues. The defender is incredibly versatile. He is equally comfortable playing in at right back as well as in the middle of defence, and has been known to push up into an anchor man role. The 6 foot 1 defender is the ideal size for a centre back, and has improved his aeriability over the past year, and is now imposing at the back. His tackling is also progressing well, and he has helped Bilbao up to a respectable mid table position so far this year. The best attribute about San Jose, though, is that he always seems to be in the right place at the right time. 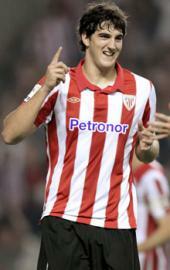 He even has a formidable goalscoring record, as shown throughout his time with Bilbao. Many clubs in Europe are watching his progress closely, but it is understood Liverpool have first option to resign the defender should Bilbao decide to let him leave.